Oval callus pad 1/8 inch thick foam, to relieve ball of foot and pain caused by calluses, warts, and alliviates pressure in sore areas for the left and right foot. When placed to foot there is a smooth transition to adjacent skin without a feeling of a lump in your shoe! The medical grade foam is precut in the correct thickness and shape to provide maximal relief of pain making each step less painful. 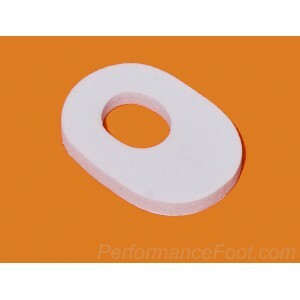 The pad is often used to shift pressure off of painful callus, warts, prominence of bone on foot or heel. How to apply: gently apply to clean and dry foot. Peel off backing from pad. Position the pad so the aperture surrounds the area of pain. Product can be worn with casual or dress shoes. Recommended Care: Product is designed for single application. Dispose after use. The life of the product is affected by it care, use and activity level. This item is available for bulk reorder. Precautions: Do not place product on an open wound. Don’t use is diabetic or have loss of sensation to skin. If irritation, discomfort, or any problems result from the use of this product then discontinue use immediately and notify your doctor.